Does your little girl love to play with Barbie dolls? Now you can throw her a party based on Barbie! The world's favorite doll is now available in a wide variety of party supplies. 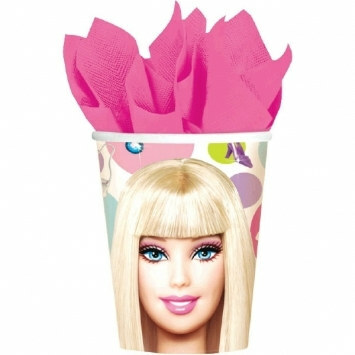 These Barbie Hot/Cold Cups will make a great addition to your party decorations. These cups feature a close up of Barbie herself, with brightly colored polka dots and Barbie's favorite accessories: shoes, purses, and sunglasses! Complete your party tableware with our matching Barbie plates and napkins!